Santa Clara Family Health Plan (SCFHP) offers you easy access to a variety of community resources. Select one of the organizations below to learn more about their programs and services and to get contact information. This information is provided as a public service. SCFHP is not a sponsor of the organizations or events referenced here. 2-1-1 is a free and confidential, 3-digit phone number and service that provides access to critical community programs and services, including: food and shelter, counseling, drug and alcohol intervention, job training, child and elder care, health care, youth programs, and so much more. Specially trained, multilingual call-center specialists offer a friendly voice while providing accurate, up-to-date information, and appropriate, culturally sensitive referrals. The Alum Rock Counseling Center (ARCC) offers several programs for high-risk youth and their families. Programs may focus on early childhood development and parent coaching, middle school student mentoring, life skills development, truancy reduction, gang-related services, mobile crisis response and counseling, case management, child abuse and neglect prevention and community outreach. These organizations can help you apply for Medi-Cal, CCHIP, or Healthy Kids. MyBenefitsCalWIN is a website that lets California residents learn about and apply for medical, food, and cash assistance programs, including Medi-Cal and CalFresh (formerly Food Stamps). For news, enrollment materials, FAQ's, and helpful videos on California’s Coordinated Care Initiative (CCI) and Cal MediConnect, visit CalDuals.org. Cal MediConnecToons videos give an overview of Cal MediConnect, the enrollment process, what letters health plan participants will receive, or how to choose a plan. The CalFresh Program (formerly called Food Stamps) helps single people and families with little or no income to buy food. In Santa Clara County, people authorized to received CalFresh benefits can buy food by using a plastic card at a grocery store or other authorized place. CalWORKS is a program that helps eligible families become self-supporting through temporary cash aid and assistance in finding and keeping a job. If you are the parent or caretaker relative of an eligible child or eligible children, you may be eligible to receive cash assistance through the California Work Opportunity and Responsibility to Kids (CalWORKS) Program. The City of San Jose offers programs and activities for all ages. Find information on community centers, community gardens, parks, picnic areas, pools, tot lots, trails, Happy Hollow Park & Zoo, etc. 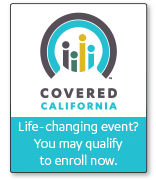 Covered California is a new marketplace where you and your family may get financial assistance to make health insurance coverage more affordable and where you will be able to compare and choose health coverage that best fits your needs and budget. Go to Santa Clara County Health Connection for information on upcoming Santa Clara County enrollment events and local application assistance. You can also check our Community Events page for information on upcoming health fairs and enrollment events. If you need a specialized phone that makes it easier to hear, dial or call, you may be able to get one for free through California Phones – a program sponsored by the California Public Utilities Commission. California Phones are available to all eligible California residents. You can receive free specialty phone equipment with certification by a medical doctor, a licensed audiologist, a qualified state agency or a hearing aid dispenser. Contact the Deaf and Disabled Telecommunications Program for more information at 1-800-806-1191, or visit their website, www.ddtp.org. Below are resources available within the community that provide free and confidential services for those who are experiencing or have experienced domestic violence, including emergency shelter and transitional housing, 24-hour crisis hotlines, safety planning, counseling and support groups, legal advocacy, and children and teen programs. Interpreters and translators are available to provide assistance with medical, legal, and other services in other languages. FIRST 5 Santa Clara County supports the healthy development of children through age 5 and offers programs and resources for early learning, health and family support. FIRST 5 Family Resource Centers offer free programs, services and activities for families with children, birth through age 5. Head Start offers part day and full day preschool and family services in various locations throughout Santa Clara County. To qualify for Head Start services, your child must be age eligible and your family must either be income eligible or categorically eligible. The Health Trust is licensed by Stanford University. Their staff is certified as Master Trainers to deliver self-management workshops for those living with chronic disease and diabetes. For more information, or to enroll in the chronic disease self-management program, please call 1-408-961-9877 or visit The Health Trust. HICAP helps you make sense of Medicare to understand your options and choose the options that best suit you and your family. HICAP is a program of Sourcewise, formerly known as the Council on Aging Silicon Valley, is not affiliated with any insurance company and offers unbiased information to help you make informed decisions about coverage. Citizenship Days – Provides SCC residents with knowledge and information needed to become U.S. citizens. English as a Second Language (ESL) – Information on classes available in SCC. Knowledge of Immigrant Nationalities (KIN) – Information about the backgrounds, values, and life conditions of immigrants. To be eligible for IHSS, you must be receiving Medi-Cal, be blind, disabled, or 65 years of age or older, AND be unable to live at home safely without help. IHSS provides services according to the IHSS recipient’s ability to perform daily activities, and can include feeding, bathing, dressing, housekeeping, laundry, shopping, meal preparation and clean up, respiration, bowel & bladder care, moving in and out of bed, rubbing the skin (to prevent skin breakdown), accompaniment to medical appointments, paramedical services, and protective supervision. The Indian Health Center (IHC) provides high quality, culturally competent medical and wellness services to American Indians/Alaska Natives and people from all walks of life, regardless of race, ethnicity, religion, gender, sexual orientation, or disability. Diabetes Education: Diabetes orientation class, diabetes education, and one-on-one case management to assist members who have been diagnosed with diabetes. Nutrition Services: Individual and group nutrition classes with a Registered Dietician/Certified Diabetes Educator. Fitness Program: IHC’s fitness center is open to SCFHP members. The fitness center has elliptical machines, treadmills, recumbent bikes, dumbbells and other strength and cardio machines. For more information, or to enroll in one of these programs, please call 1-408-445-3400, ext. 278, or visit Indian Health Center - Wellness Center. The Santa Clara County Senior Nutrition Program provides high quality, cost efficient, nutritious meals to seniors, including hot lunches at specific locations and Meals on Wheels. Social Services Agency, Santa Clara County, contact information for Medi-Cal inquiries. Provides transportation for individuals with disabilities who are unable to use the public transit bus and light-rail systems some or all of the time, for seniors who have limited transportation options because of cost or availability, and for individuals in Santa Clara County’s CalWORKS Program. Rebuilding Together Silicon Valley is a non-profit agency devoted to providing critical home repairs and accessibility modifications for low-income homeowners and community centers, at no cost to the recipient. Provides food, clothing, and emergency financial assistance. Offers tools and resources for attaining self-sufficiency, including Family Support, Education, JobLink Employment Services, Asset Building for Independence, La Mesa Verde urban gardening programs, and the SHCS Leadership Collective for customers who also want to volunteer. Santa Clara County Health Connection is a website that provides information about upcoming events in Santa Clara County that may offer assistance in or information on enrolling in health insurance programs, including Covered California, Medi-Cal, and Healthy Kids. Provides food to people in need in Santa Clara and San Mateo counties. Call the Food Connection Hotline for information on all of Second Harvest Food Bank’s food assistance programs. Hours: Monday – Friday, 8:30 a.m. to 4:00 p.m.
SVILC’s programs and services address the comprehensive needs that individuals with disabilities have when attempting to gain or increase their independence. Programs and services address advocacy, independent living skills training, information and referral, and peer counseling. SVILC provides Assistive Technology services and is a Device Lending Library. Provides low-income individuals and families with access to health, financial, nutritional, and employment. Sourcewise, previously Council on Aging Silicon Valley, has updated its name to reflect the expanded community it serves – all adults in Santa Clara County. Sourcewise aims to inform, educate, and prepare all adults within Santa Clara County to better navigate their health and life options. Sourcewise provides adults (whether or not seniors), their families, and their caregivers with services and solutions designed to help maintain independence and receive appropriate care, regardless of economic status. Sourcewise offers a broad range of services to the community including: information, care management, Health Insurance Counseling & Advocacy Program (see HICAP, below), senior employment services, Meals on Wheels, and Sourcewise public authority services. A free service of the National Healthy Mothers, Healthy Babies Coalition at www.Text4baby.org. If you text BABY to 5114111, you will get free messages on your cell phone to help you through your pregnancy and your baby’s first year. WIC, the Women, Infants and Children Program, is a nutrition program that helps pregnant women, mothers of infants, infants and young children eat well, be active, and stay healthy. work2future offers a full range of no-cost services for youth and adults who are interested in receiving training to build job skills or assistance in job search. Training locations are in San Jose, Gilroy, and Morgan Hill. Youth and young adults: Training, summer jobs or paid internships are available through Santa Clara County Youth Works or San Jose Works. Adults: General assistance in employment search, job listings, and job training information is available. Offers health, fitness and wellness programs, youth programs, camps, family activities, swimming and aquatics, and other activities for people of all ages, incomes and abilities. The YMCA of Silicon Valley has 10 full-facility locations and YMCA Camp Campbell, a wilderness resident camp in the Santa Cruz Mountains. The YMCA also partners with the City of Morgan Hill to operate health and fitness programming and senior adult programs at the Centennial Recreation Center. Financial assistance is offered to individuals and families who cannot afford membership.